Beat the score shown on the small wheel and it will turn giving you a prize. The prize is shown as e.g. 5X, which means 5 times the amount you paid in to the game. Beat the score on the big wheel and that one will turn instead of the small one. The big wheel has higher prizes. One of the prizes you can win is the Jackpot. Each game a percentage – shown on the wheel – is added to the jackpot, until someone wins it. 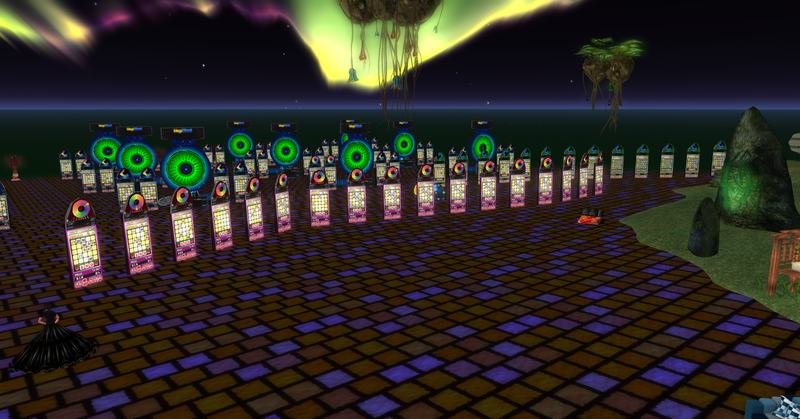 Typically there are multiple games with small wheels connected to a single big MegaWheel. So multiple players can play at the same time. Each small wheel has its own pot. On the MegaWheel you can win rather high prizes with relativly low scores. Besides MegaWheels with a small wheel and a big wheel we also offer solo wheels. With a solo wheel you have a wheel on top of the game but no big wheel. The biggest advantage of that: The score to beat is much lower. We offer two different solo wheels, both with different prizes to win. On the picture you see a solo wheel. On the wheel you see a score, beat that score to make the wheel spin. The percentage is the percentage of your buy-in amount that will be added to the pot. 5% in this example. Each game, the pot grows. You see also the size of the pot, currently it is L$10,000. And there is something with steps. Steps, is 5 now. It will change every game. 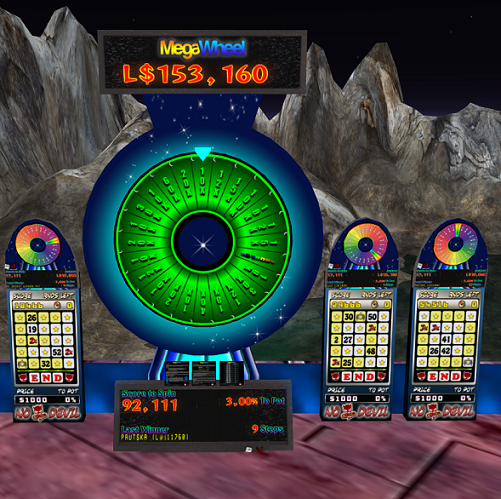 MegaWheel is a skill gaming device, no random number at all is used when the wheel spins. The wheel spins a number of steps, clockwise or counter-clockwise and all that is determined by your score, our range step table and the number of steps shown on the machine. You know the steps on the machine and the range step table (we use the default table provided by the creator of the game) before the game starts and you determine your score yourself….So you have big influence on the outcome of the wheel spin. For the details, look on the 3 black signs we put on every big wheel and a few extra ones near the machines. It is of course not a very easy story, but rather straightforward.